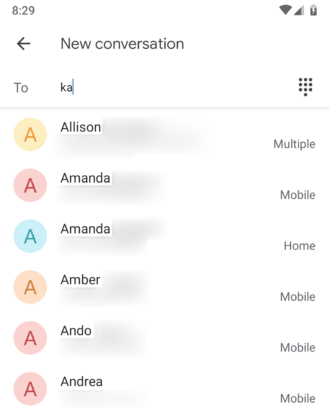 Group chats are great for coordination or keeping up with friends, but the way they were displayed in the main list was sometimes problematic. 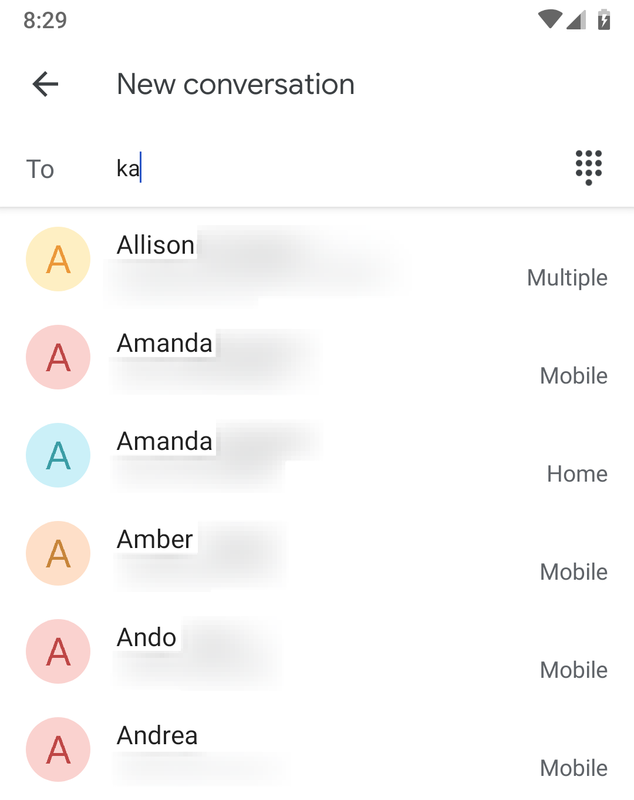 The Messages app would simply take the group members and list each by their first name with a comma separating each member. 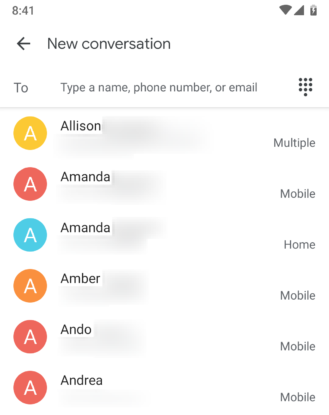 This worked, but it was easy to confuse the group chat for a private chat with the first person listed, and nearly impossible to discern multiple group chats that happen to include a few of the same people. With the latest update, Messages now allows you to define your own name for group chats. 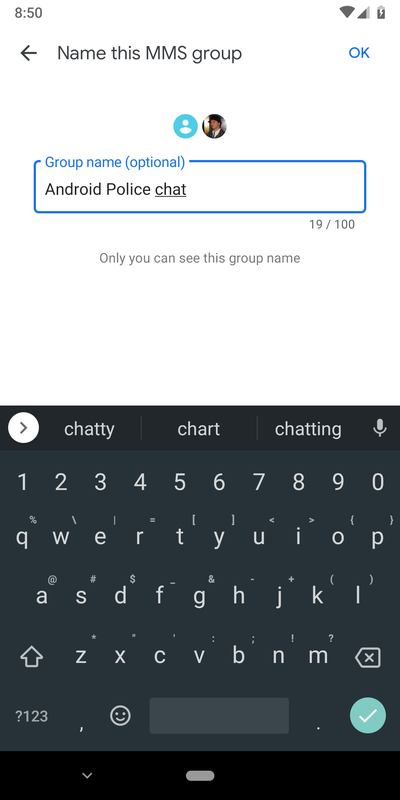 Simply open the group chat you wish to rename, find Group Details in the overflow menu, and look for a new field at the top of the detail screen where you can define your own group name. The new name will be shown in the conversation list and at the top of the conversation itself. 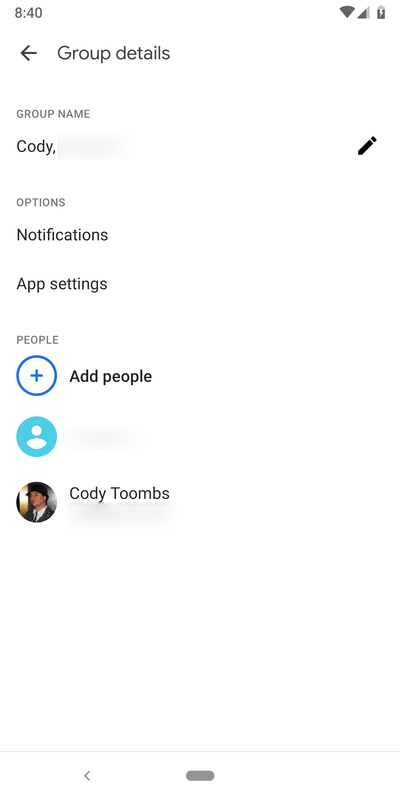 Back in October, an update to the Google Contacts app brought a small, but very welcome (imho) change to the styling used for contacts that didn't have pictures. Previous versions placed the first letter of the name on a pastel background. With the updated look, the shapes stayed the same, but the letters were made white and the colored backgrounds were pushed to vibrant colors that provided more contrast. 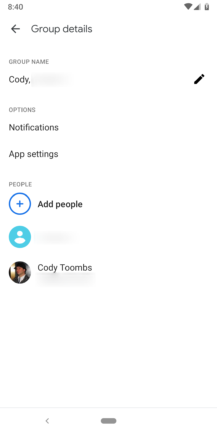 It took a few months, but the new version of Messages has adopted the same change, and now all three of Google's primary contact-based apps (Phone, Messages, and Contacts) are using the same styling for contacts. Cheers for consistency! 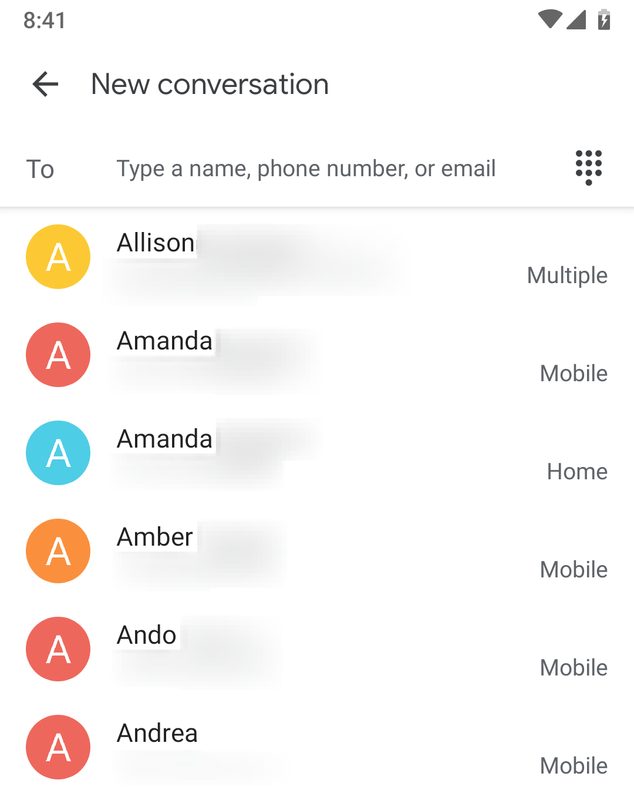 ... err, well, the colors used for each contact don't actually match across apps, but I'd rather not nitpick this. Admit it, there was at least one time in your life that you turned on airplane mode and then forgot about it. Messages currently doesn't give you much of a heads up about this, only placing a fairly inconspicuous message across the top of chat windows to let you know there's no connection. While that might be enough to remind you or I that airplane mode is on, many people might assume they're in an area without cell service, and even attempting to send a message will only give you a warning that the phone is waiting for a connection. 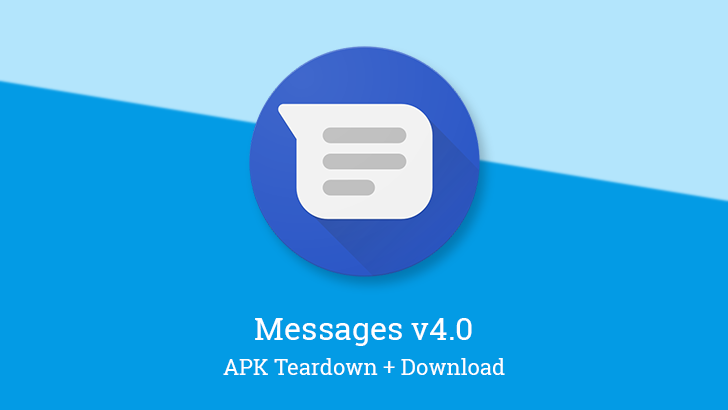 A new line has been added that suggests Messages will begin detecting airplane mode and reminding users to turn it off. It's not quite clear if this will provide an interface to disable airplane mode directly from within the app, but even just having the clear reminder is enough. We know RCS allows for larger attachments and a generally richer experience. While most people think about sharing pictures and video, there are still other situations where you might want to share more unusual types of data. A few new lines have been added that seem intentionally generic, preferring the word "file" in place of terms like "photo" or "video." It's entirely possible these strings were written this way to avoid writing multiple variations, or perhaps to acknowledge that attachments could include multiple data types at once, but it could also mean Messages will support sending unknown file types. I won't get into the potential side effects or security issues involved with sending generic files, but I think it's fair to point out that Google may as well support it since other RCS apps will surely allow it. I'm not confident that anything in this section will ever be intended for regular (or even highly technical) users, but I'm including it because it may be of interest to some people that may want to poke around. There's text and settings for two new areas where it's possible to enter a custom phone number. The first addition is an advanced setting that seems to be related to RCS. The first few lines instruct users to enter a phone number to finish setting up chat features, which is strange since RCS would typically just use the numbers provided by SIMs. Again, that makes this seem like something that may only be intended for testing purposes. On the other hand, this may be tapping into features of RCS that aren't widely publicized. This aspect is reinforced by the following text that informs users that the app will occasionally verify the number with your carrier. To me, this sounds a bit like the setup details that would come with enabling multiple (or at least different) devices to receive messages that are sent to a single number, but I don't want to speculate much without more research. The second addition is for defining your own SMSC (Short Message Service Center) number, which is basically the service that takes responsibility for storing SMS messages until they can be delivered to the destination. My assumption is that this will allow testing of new services or diagnosing networking issues. 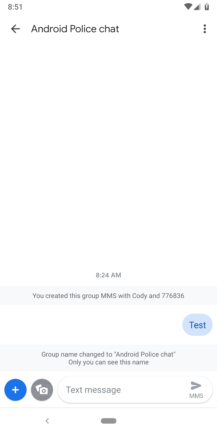 Changing your SMS service, especially to a destination that doesn't exist, would obviously cause messaging to stop working correctly, which is why I doubt this will be exposed to regular people. RCS is picking up steam, even if the ideal adoption rate and user experience is still a long way from here. Google happens to be experimenting with different messages to introduce users to the new features and let them know how it works. Three different versions of the promotional text are included below. They're obviously not important to features, but I figured some people might find it interesting.